Satellites and spacecraft are mainly composed of light metallic alloys and composites that have a high specific strength (ratio of material strength to material density). This allows them to be shaped into light yet robust structures that can be safely launched to orbit and even delivered to distant planets, like Mars. As launching spacecraft becomes more affordable and satellites become more reliable, a profitable space economy is on the horizon. However, in order to maximize spacecraft longevity and thus the chance of a successful mission, several factors must be taken into consideration. In space, there are no fueling stations or repair shops, and for interplanetary probes, no on-board crew who can maintain and control the spacecraft, so not much can be done in the event of a failure. Therefore, engineering spacecraft capable of self-controlled, self-adapting, and self-healing behavior to cope with the predictable and unpredictable challenges encountered in space is crucial. 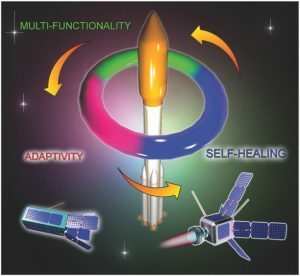 These three key features—self-healing, dynamic adaptation, and multifunctionality—offer a “life raft” for spacecraft, ensuring survival and efficient operation under the rapidly changing conditions of space. Although there is already a rich diversity of approaches and material platforms that have one or more of these features, and some progress has already been made in which the basic principles of self-healing have been explored for alloys, composites, and polymers, significant progress is still required in order to apply dynamic self-healing materials to space technology. In their essay in Advanced Materials, Igor Levchenko from Nanyang Technological University, Kateryna Bazaka from Queensland University of Technology, and their colleagues discuss the materials-driven development of current and future space technology in terms of these three key features, with a focus on space propulsion systems and small satellites. The authors show how the existing platforms can be translated and integrated into space technology to provide novel capabilities for future spacecraft. For satellites, this means composite, nanomaterial, and metamaterial-based ultrathin solar cells and supercapacitors for all power units; ultralight, flexible, and printable electronic components; propellant tanks made of thin metal layers and carbon-nanotube-based fibers; robust, 3D-printed parts made from advanced polymers and metals for the satellite body; and self-healing materials for the chassis, antennas, and other critical components of the spacecraft. A number of adjustments could also be made to optimize the performance of thruster systems, including nanodiamond coatings and boron nitride to reduce ion-flux-related wear and enhance discharge efficiency; cold cathodes composed of dense, ultrathin nanotubes, nanowires, and vertically oriented graphene flakes; and a magnetic system based on graphene. The authors recognize that implementing these features is no trivial task.